I got the idea for this gradient mani with splatter activity over HERE - I originally wanted to copy her awesome colour choices, but then I glanced over and saw my newly beloved neon polish blaring at my retinas, and I knew what I had to do. I started with a coat of Orly White Out as a base for my neons.. Then I think I used 3-4 thin coats of Essie Action, and waited for that all to dry. Then I just sponged on some Essie Lights.. THEN I globbed some Orly White Out on my ever-handy paper, dipped my trusty straw in and attempted to splatter up my nails. I still haven't mastered this technique, but I will. It is my new life mission. I may or may not be joking. I'm going to say that this orange is absolutely AH-MAY-ZING! It is exceptionally bright.. I actually got some nail mail earlier.. And that had a neon polish within it.. and it is searingly gorgeous. I cannot wait to share that sweet gem with you all! I hope everyone is having a great Friday! I will be back with something for all of you again very soon!! Thank you all - I quite like them.. So bold and in-your-face! This looks AWESOME. Love it! Awh I am so glad you did these! They look so pretty! I love neon splatters honestly! It looks killer with black splats! haha I use a poster board when I am doing nail art so mess stays on there. Tape helps load with clean up, and if you don't have tape Vaseline will do the job just as well. 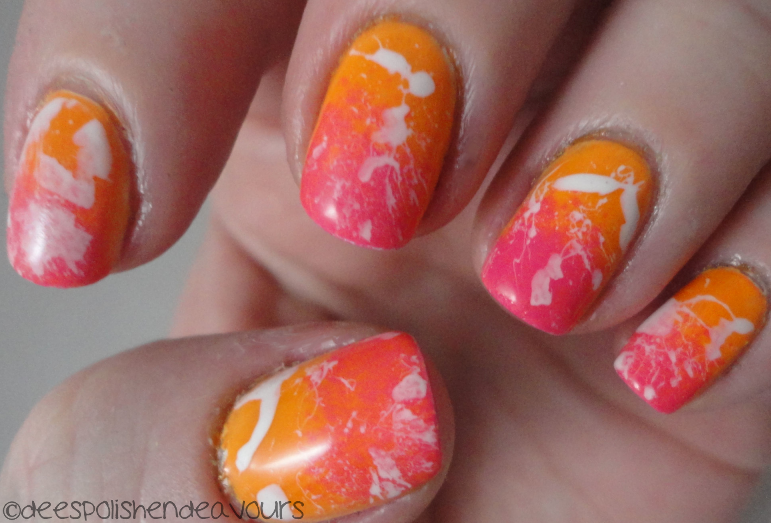 Love the colours, love their combo, love the splatter :D ! Lights, Camera? Pirouette My Whistle!